As far as the outdoor activities UK locations like ours here in Bude, Cornwall offer, the scope is huge and you can find a wonderful range that is hard to resist! So if you are looking at residential trips, for example, you will want to think about the activities you are most likely going to want to experience. One that can be overlooked is Coasteering, so we are going to run through some of the basics on this relatively new activity, and hopefully you’ll see why it’s so appealing. 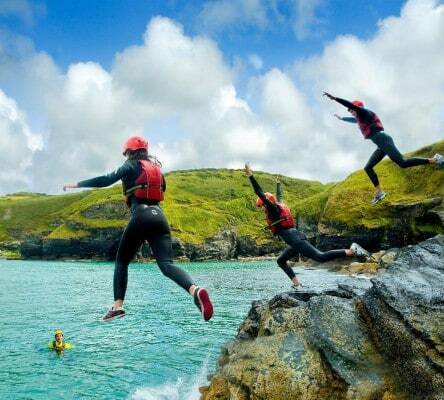 Heading on out with a group, led by our fully trained instructors, as you embark on a thrilling little hike through the popular rocky, rugged landscapes of the Cornish coast, then leaping from cliff edges into the water and swimming in the sea… It’s a thrill seekers dream and has great allure. 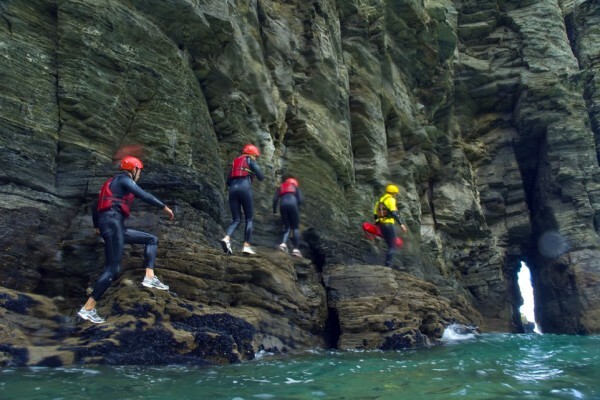 You don’t have to be the biggest adrenaline junkie to take part in Coasteering because you’re sure to be able to take in the sights, smells, sounds and other goings on that these natural locations offer. It’s simply one big adventure from start to finish! Originally, Coasteering’s beginnings lie back in the 1980s, however, it’s not really until the last half a decade or so that it has evolved into one of the leading activities for adventure junkies. Today, many people proclaim that Coasteering is actually the most popular activity on offer at some activity centres, according to the National Coasteering Charter. How do you do Coasteering? Depending on where you do Coasteering, your experiences can differ, but we will be focusing our attentions on the kind of adventure you will have here with us at Outdoor Adventure. First things first, you need to be able to swim, and you are most definitely going to be getting wet! 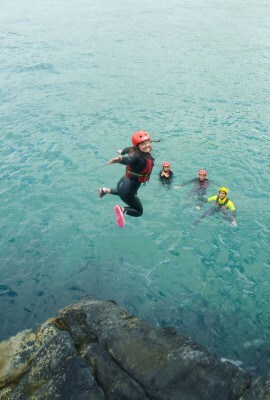 Swimming in the sea is one of the main attractions of Coasteering. You can expect to come across local gullies and caves as you paddle around in the water and explore the surroundings. If you’re not a fan of the water, however, then sadly coasteering just isn’t for you. Any route which purposely avoids the water or allows you to use ropes and harnesses to stay dry is not considered coasteering. Some will love this bit, and some won’t be so keen, but ‘the jump’ as you drop into the sea below, is one of the most exciting parts of coasteering. It’s one to get the blood flowing and is almost definitely going to be the main talking point with friends and family. If you have any hesitations, there’s no need to fret just yet, as the highest drops are usually no more than a few metres high, although some Coasteering trips can offer drops of up to ten metres! The jumps are the briefest moments of Coasteering but as we’ve mentioned, they’ll be the most memorable. You’ll have the chance to navigate along various types of terrain, as the guides lead you around areas that you cannot access on foot, normally. Our Coasteering sessions are led by experienced instructors, as they have superb local knowledge and a real understanding of the ocean and weather conditions. They pick a route to give people a fantastic adventure whilst making sure everyone sticks within their limits. It’s a fantastic feeling being washed around by the waves and bobbing around in the ocean! What will I need to go Coasteering? We will provide you with all the safety kit you’ll need on the day, you just need to bring old trainers, a towel, and some swimwear; we’ve got everything else you need. You’ll be wearing a wetsuit, helmet and a buoyancy aid while you’re out on your trip. This will not only keep you afloat when you’re swimming in the sea and bobbing about, it’ll keep you warm and will also stop any abrasion on some of the rough surfaces. Fear not, you’ll be fully protected, and feeling safe means you can have all the fun you want!